Ranakpur is a picturesque village located in the Pali district of Rajasthan and is one of the most important pilgrim sites recognized for its magnificent temples. It is nested in a valley on the western side of the Aravalli Range and lies between the Jodhpur and Udaipur. Ranakpur has carved a niche among the other places of tourist interest and is now one of the most visited ones in the entire state of Rajasthan. Make your tour to Ranakpur an amazing experience since it has exquisite Jain temples that are known for their marvelous architecture. 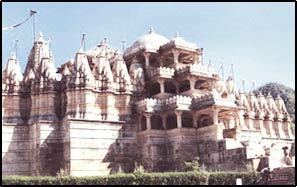 The Jain temples are some of the leading tourist attractions in Ranakpur. The temples are acknowledged for their outstanding beauty and remain the most visited ones among the various pilgrim sites in Rajasthan. The chief temple is the Chaumukha temple (four-faced temple) and it is dedicated to Adinath, who was the first Jain tirthankar ( Jain Spiritual head ). You will also come across the other Jain temples that are located within the complex including the Sun temple and Amba temple that are equally popular for their brilliant architecture. Lots of pilgrims drop in every day at these temples for offering prayers. Ranakpur, in Rajasthan can best be visited from October to March due to pleasant climatic conditions. For the numerous tourists dropping in to Ranakpur, there are several lodging options available here in heritage, deluxe heritage and budget categories. There is a heritage hotel, Maharani Bagh Orchard Retreat and deluxe heritage hotel, Hotel Fateh Bagh where you can put up. There also the budget hotels among which Hotel Shilpi and Shivika Lake Hotel are notable. If you want to reach Ranakpur, then you have to come down to Udaipur from where you can easily access Ranakpur. Udaipur is conveniently accessible by air, rail and road transport from the distant corners of India. Apart from Ranakpur, you can also make a short excursion to Kumbhalgarh which is a historical site located at a distance of 30 kms to the north east of Ranakpur. It is home to an important fort after Chittorgarh and the Wildlife Sanctuary here is also worth paying a visit famous for a number of endangered species. You can come across many creatures Wolf, Leopards, Sloth bear, Hyena, jackal, Jungle cat, Sambhar, Nilgai, Chausingha (the four horned antelope), Chinkara and Hare. Here you will also encounter an vast range of bird species that enrich the charm of this place substantially. Know more about Ranakpur by clicking on to the site touristplacesinindia.com, which offers valuable travel information on Ranakpur.